Terrorist attacks, infectious diseases, financial crises, and floods—what makes contemporary dangers so threatening is their tendency to suddenly materialize, rapidly escalate and quickly spread. So how might we respond to such threats? 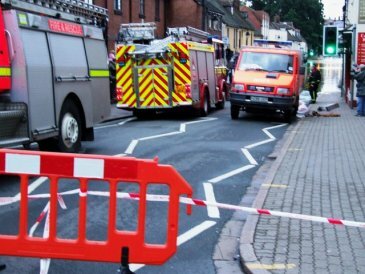 In my recent article in Security Dialogue, I investigate how emergency responses are being reorganized in the UK to grapple with the speed and unpredictability of contemporary emergencies. Specifically, I focus on the framework of Integrated Emergency Management (IEM). IEM looks to accelerate the speed of emergency responses in order to hasten recovery. It does so by adopting new models of emergency organization rooted in the principles of communication and information exchange. Various information and communications technologies are relied on to circulate information between the diverse agencies (e.g. police, firefighters, ambulance, etc) involved in the response. The aim is to achieve ‘shared situational awareness’—that is, a common understanding of the nature of the event and the response’s progress by all responders. Shared situational awareness is said to improve the integration of different response agencies cooperating within a response, enhance problem-solving and permit the devolution of responsibilities from senior commanders to front-line responders. The result is a model of emergency response governed from the bottom-up. As responders identify the extent of the challenges wrought by any given emergency (e.g. a road has been flooded, x number of hospital beds are needed, a cordon needs to be set up) then different response plans may be actioned, new levels of command and control introduced, and distinct specialist agencies invited to assist in the response. The result is a bespoke emergency response that can be quickly assembled and adapted to address the unique challenges arising from the often-unpredictable unfolding of an evolving emergency. As I demonstrate in my article, speed is a principle consideration when it comes to strategizing the organization of emergency responses today. Ideally, we might think of security as a space free from danger. But emergency responses cannot prevent an emergency from happening. Instead, they are premised on the hope that when emergencies happen, that actions can be taken to quickly resolve it. Speed is critical in this regard. IEM looks to ensure a swift return to ‘normality’ following an emergency. It does so by accelerating emergency response activities to diminish an emergency’s temporal duration, geographic scope, and destructive potential. Operationalizing a model of emergency responses rooted in the idea of bottom-up self-organization, emergency responses must evolve quicker than threat itself! Emergency responses, in this respect, can be understood to underpin efforts to enhance UK resilience, ensuring our capacity to quickly ‘bounce back’ from disruptive challenges. In my article, I call the distinct form of security enacted within emergency responses ‘event-suppression’. Event suppression ensures security not by preventing an event from happening, but by quickly closing down the ‘disruptive’ time of the emergency event and ensure a swift return to ‘normality’. Event-suppression ensures that when events happen, that they have a minimal disruptive impact on ‘daily life’. Event-suppression ensures that when events happen, that they have a minimal disruptive impact on ‘daily life’. On the one hand, distinguishing event-suppression as a distinct form of security might encourage us to consider the very different modes through which security is achieved. On the other hand, we might consider the implications of this ‘need for speed’ for contemporary security politics. Does it undermine slow democratic process of debate and discussion? Is it sufficiently checked by slower processes such as training, planning, and the drafting of legislation? How does such an understanding relate to more spatially oriented analyses examining ‘state of emergencies’?